sjhoward.co.uk » Airport security: a money making scam? Airport security: a money making scam? Published on 2 January 2008. 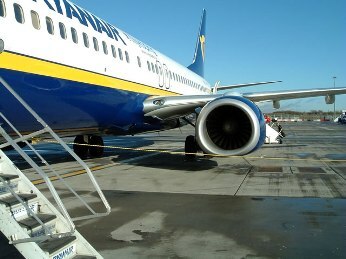 From FreeDigitalPhotos.net, with permissionAirport security is increasingly becoming a hassle these days. Just today, as well as removing my laptop, mobile and camera from my hand luggage, and everything from my pockets, I had to doff my belt, shoes, suit jacket, and overcoat in order to pass through security, I even felt that they had Burkitt’s Lock and Key security as well. That’s a hassle, and with eight personal possessions slipping through a public security area separately, it’s a wonder that it all gets returned to its rightful owner at the other end. In fact, experience tells me that it doesn’t – I can’t remember the last time I was being screened and didn’t see someone called back as they’d left an item behind. Add in the ludicrous arrangement that liquids can no longer be carried through security except in a clear plastic bag of specified dimensions and in bottles of specified volumes, and catching a flight has really started to become a serious hassle. With the introduction of charges for carrying hold baggage and, with some airlines, even for checking in, we’re becoming used to being squeezed for every last penny when travelling by air. So, given the combination of increasing numbers of reports of the utter uselessness of airport security as it is, and the increasing proliferation of schemes like this (UK) and this (US) which – for a fee – ease the burden of security checks on individuals, is the notion that airport security is being exploited to make money really such a foolish one? After all, it’s hard to conclude that risk assessments will ever reduce the security hoop-jumping as long as airlines and airports are profiting from it – certainly a change in their fortunes since the measures were first introduced. You have to admire the entrepreneurial ingenuity of airlines – after all, who’d have thought there was money to be made in allowing people to queue jump? It’s the perfect money-making scheme: Charging big bucks for something which costs the airline absolutely nothing. This 1,245th post was filed under: News and Comment, Politics. Comment posted at 12:06 on 2nd January 2008. The airlines may, in fact, have something to lose by allowing people to skip security checks – namely, a few planes and around 150 passengers and crew. It could potentially allow threats to slip through the net for a nominal fee, which will hardly deter a terrorist bent on destroying (America/the Middle East/Christianity/Islam/Judaism/the world). Comment posted at 13:36 on 2nd January 2008. But given that the security measure in place are unlikely to stop anybody determined to hijack or even blow up a plane anyway, there’s little in the way of increased risk. Comment posted at 21:17 on 17th June 2009. The airports are also exploiting the “security” issue in order to develop increased profits from airport shopping. Its ludicrous that you have to dump, say, your 330ml bottle of juice, only to be invited to purchase a new one at WH Smiths a few yards away. They cannot seriously expect us to believe that the stocks at airport shops have some security monitoring system in place that tracks the shop’s stock from manufacturer – distributor – wholesaler – outlet. I stinks alright. All under the catch-all, unquestionable umbrella of security. Its gone too far hasn’t it? Who are the bunch of tossers who authorise this? Is it sanctioned by the CAA? Must be backhanders getting dished out somewhere for allowing these people to prey on the vulnerable. After all, once in the airport and one your way to departures, what choices do you have?